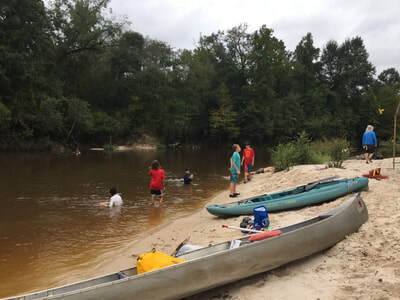 Last September, Troop 89 went on a float trip in VillageCreek River, by Double Lake. They left very early Saturday morning, canoed about nine miles up a river, stayed the night, and then traveled about a mile on Sunday before heading home. They camped on a beach on the river, and had a great time. The float trip was an awesome experience, and we can’t wait to see you on the next campout. Last July Troop 89 attended summer camp at Camp Alexander, Colorado. The drive took two days, so on the way up the troop slept at Kwahdi Lodge, a native American Museum. The museum featured a Native American dance as well as tons of cool artifacts. The camp Itself was amazing. Mountain scenery was everywhere. Merit badge classes were from Monday to Thursday, as the scouts learned unique skills. 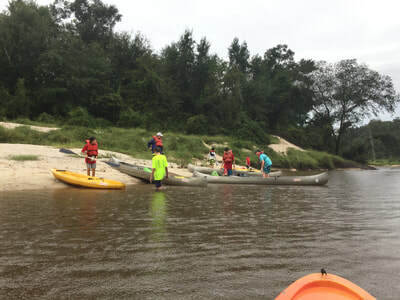 On Friday, Members of the troop flew through Class 3 rapids during whitewater rafting. Overall, the trip was awesome. The troop has plans of returning next summer, and we hope to see you there! Last May, Troop 89 visited Galveston. This campout is one of the favorites because the scouts get to go to Schlitterbahn, one of the most famous waterparks in Texas. The scouts spent most of Saturday there, and then relaxed on the beach. For dinner, the Old Goat patrol made a fantastic barbecue for everyone. This was such a great campout, and we hope you enjoy the rest of your summer ! 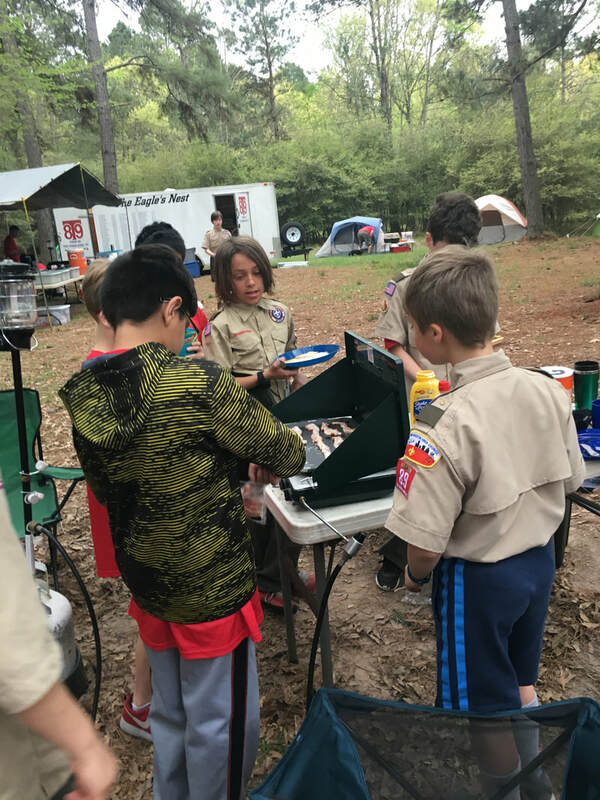 Back in April, our Troop 89 scouts attended Camporee. This is a special campout because all the troops in the Tall Timbers district were invited. The weekend was a fun competition with scout themed activities such as fire building, knot tying, and a stretcher relay. On Saturday night, there was a cooking challenge, and many Dutch oven treats were made. Our scouts had such a fun weekend, and we hope to see you on the next one! This last March, Troop 89 spent a weekend at Cunningham Ranch. Mr. Cunningham, a former Troop 89 leader, lets the boys camp on his property every year. This is the new scout campout, and all 11 new scouts attended the event. By the end of the campout, most of the boys had reached Scout rank, their first step in the journey to Eagle. In the morning, the Troop worked on skills, such as cooking and tying knots.The afternoon was fun time, which was spent relaxing, fishing, shooting BB guns, and playing in the river. At dinner, the Megaladon patrol won the prestigious Iron Skillet with a delicious meal of fried shrimp. After that was a lively campout filled with hilarious skits. This campout was a lot of fun, and I can’t wait to see you at the next one! ​Winter camp was held at The Bovay Scout Ranch, here scouts earned merit badges over a course of four days.The great thing about Bovay is that the merit badge classes are taught by professionals, so you feel that you're actually learning something. Every winter camp held here at Bovay there is a theme for the scouts to participate in. The theme for this winter camp was "Winter camp is coming." This is a reference to HBO's Game Of Thrones, so a lot of troops and scouts were dressed up in Knight armour presenting their troop as a kingdom,( and usually their scout master was the king!) At Bovay there is also a theme night to celebrate this theme, different contests and events are held there so if you want to have a fun night participate in theme night! ​​December 2, 2017, Troop 89 took a backpacking trip to the Lone Star Hiking Trail where they hiked for 6 1/2 miles. Here is a fallen tree, they used it as a convenient bridge to walk across. Notice the boys wearing bright colors? They came prepared, It's deer season in Texas and you will need to be seen. Troop 89 attended Webelos Woods at Bovay Scout Ranch in Navasota, Texas November 10-12. Webelos Woods is a campout for the Webelos Scouts to see the many outdoor adventures of the Boy Scouts. Webelos came from all around our area hoping to learn about Boy Scout Troops they were interested in joining. 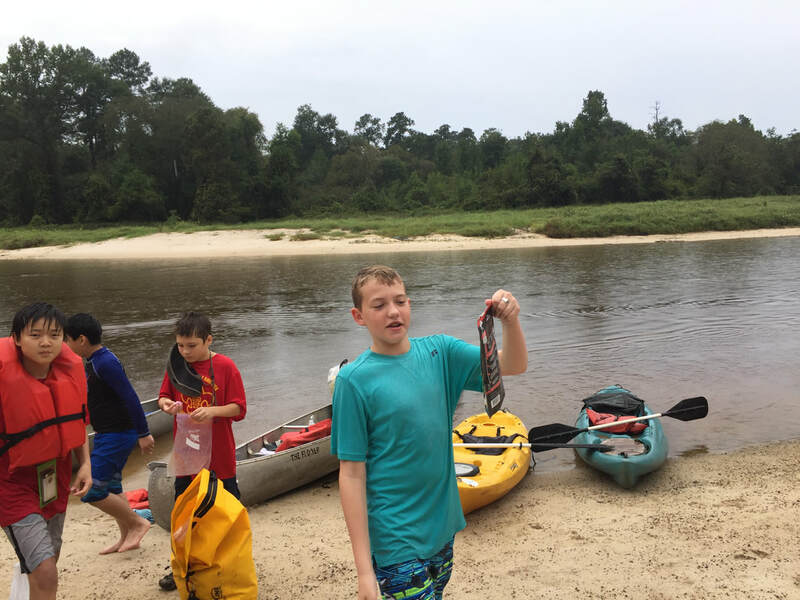 Troop 889 joined our Troop for a weekend of fun. We set up tents and prepared their meals. Saturday was a day of fun. There were many activities to participate in such as learning to build a fire, learning how to tie knots, cooking demonstrations, and so much more. At our campsite we set up a game called Sky Nine. It is a simple and fun game similar to 4 square. It was designed to involve more people. There was a campfire Saturday evening where many of the scouts involved participated in their favorite skit or song. It's always a lot of fun. Sunday morning we all joined together to clean our campsite then we gathered together for a worship service. It was a great weekend.